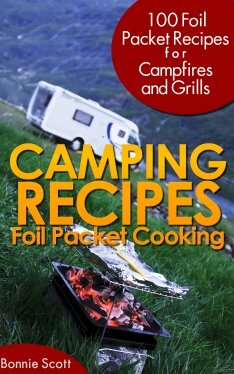 In many camping places, balsam branches, or moss, are available for improvising mattresses. 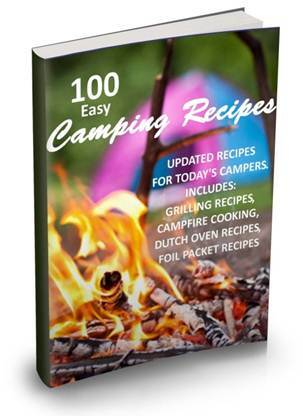 Used in connection with a hammock, or a bed made on the spot, such a mattress substitute provides a comfort that adds to the joys of camping. A camp hammock, or bed of this kind, is shown. To make the hammock, cut four 6-ft. poles, of nearly the same weight and 1 in. in diameter at the small end. These saplings should have a fork about 2 1/2 ft. from the lower ends, as resting places for the crossbars, as shown. Then cut two poles, 2 in. in diameter and 3 1/2 ft. long, and two smaller poles, 3 ft. long. Also cut two forked poles, 4 1/2 ft. long, for the diagonal braces. 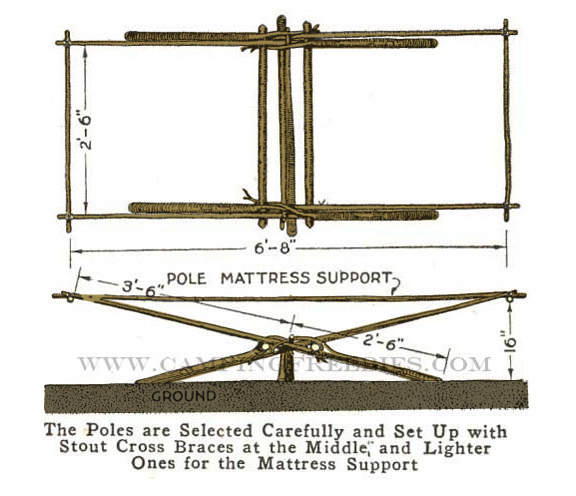 Place two of the long poles crossing each other, as shown, 1 ft. from the ground. Set up the second pair similarly. Fix the crossbars into place, in the crotches, the ends of the crotch branches being fastened under the opposite crossbar. 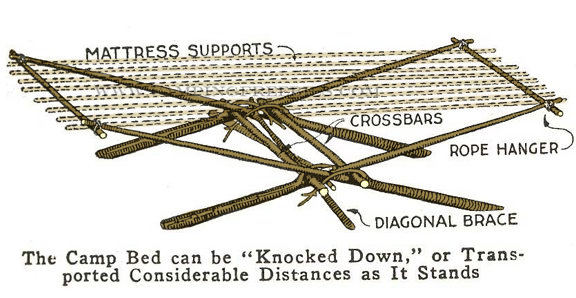 The end bars are fixed to the crossed poles by means of short rope loops. 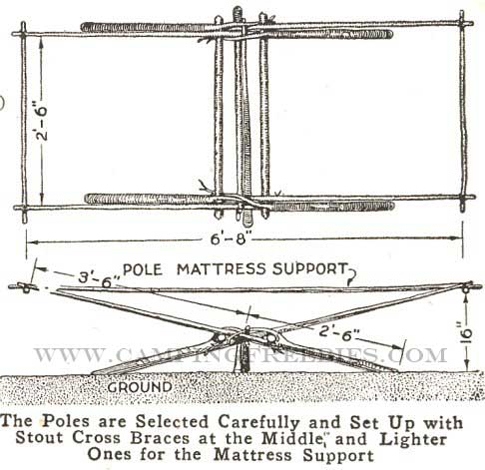 The mattress is placed on springy poles, 7 ft. long and 2 in. apart, alternating thick and thin ends. The moss is laid over the poles, and the balsam branches spread on thickly. Blankets may be used as a cover.